This day blessed Benedict in the presence of his brethren ascended directly from his cell toward the East into heaven; this day, his hands raised, he breathed forth his soul in prayer; this day he was received by the Angels into glory. I am always interested in highlighting such references to "the East", for they typically help to highlight the theological and symbolic importance of the East in Christian tradition and practice. 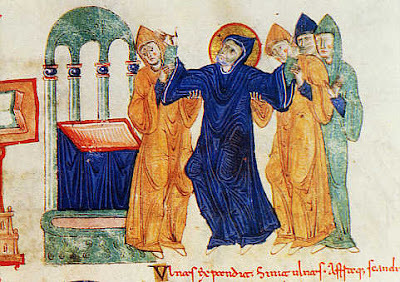 In this proper we read that Benedict ascended from his cell "toward the East into heaven." While we are on the topic of Benedict, do not forget that you can listen to the Benedictine monks of Norcia, the birthplace of St. Benedict, chant the Divine office, not only on Sundays, but every day. Readers may also like to consider reading the Rule of St. Benedict as part of their own spiritual reading. I would certainly recommend it. It can be purchased here in a Latin-English, hardcover edition. You may also read it online. Readers may also be interested in this CD of Gregorian Chant for the Feast of St. Benedict.